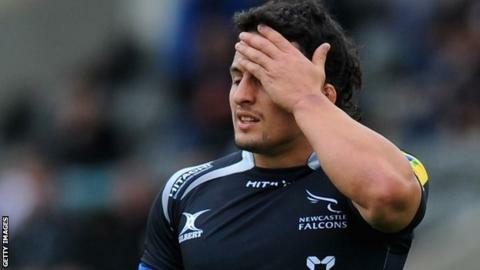 Newcastle Falcons director of rugby Dean Richards has absolved Juan Pablo Socino of blame for Sunday's Premiership defeat by London Irish. Although Falcons scored three tries, the Argentine centre missed five of six kicks while the Exiles landed two penalties and two conversions. Those efforts proved crucial as Newcastle lost 20-18. Richards told BBC Newcastle: "You don't want to blame one person and I won't because we had other opportunities." Socino's final missed kick rebounded off the uprights to deny Falcons a first win since October 2013. "Juan tried to hold his hand up in the changing room and say it was his fault but it was nothing to do with him," former Harlequins and Leicester boss Richards added. "We conceded two easy tries and some silly penalties we gave away which contributed to what happened." The ex-Rotherham centre joined the Falcons in the summer and has been ever-present in the Premiership this season. Falcons are currently second bottom in the Premiership, with one point from two games.